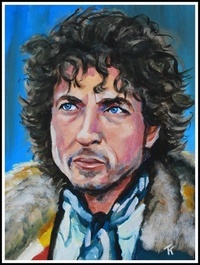 Painting of Bob Dylan from the time of his appearance on the Letterman Show in New York. Because it;s on heavyweight paper rather than canvas and can be sent in a tube I have priced this at just £150. With quality paper such as this there will be no effect on durability.